Urs Volz races to a second-place finish at the Natureâs Bakery Twilight Invitational in Sparks. 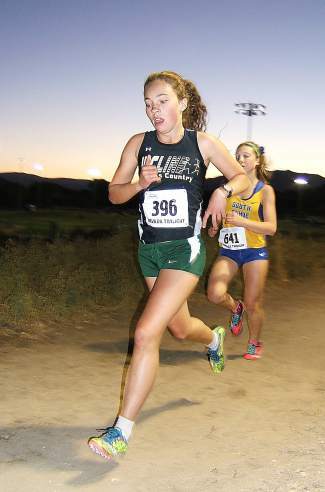 Incline junior Urs Volz led the Highlanders with a second-place finish under the lights at the Nature’s Bakery Twilight Invitational in Sparks this past Friday. Volz covered the hilly, 4-kilometer course in a time of 16:39, while Cassi Land of Sonora won the varsity small-school race with a time of 15:18. Twenty-six girls were entered in the race. The varsity boys small-school race had 64 runners. Junior Jeremy Goldberg led the Incline boys with a 20th-place finish in 15:49. Goldberg was followed by Incline teammates Cole Powell (16:34), Mitchell Cornell (17:06), Dillon Jenkins (17:18), Nelson Bedient (17:27), Brandon Swick (18:10), Brent Wolf (18:16), Scott Jones (18:40) and Andrico Mourelatos (18:41). The Incline volleyball team is set to begin Division III play with a home match against rival North Tahoe this Thursday, Sept. 10, at 5 p.m.
Incline enters the match with 1-2 record after competing against large schools in the Carmichael (Calif.) Invitational this past weekend. The Highlanders defeated Argonaut (Jackson, Calif.) 2-1 and lost to Marin Catholic (Kenfield, Calif.), 3-0, and Yuba City, 2-0. North Tahoe is off to a 5-1 start, with wins over Coleville, Sierra Lutheran, Quincy, Whittell and Elko. The Lakers’ one loss came against Antelope.